Just burp the lid to keep your bat fresh for weeks! Anyone else thinking of Dan Aykroyd and John Candy? I remember reading the webpage that this came from, about a guy with a serious bat problem in his house. Tupperware is good stuff for that! Their screeches are intimidating but they’re just scared, afterall..
@Jesus Christ: Wait. So, is Jesus a chich or is gay marriage legal in heaven? Slide a piece of cardboard or magazine in between the opening of the container and the wall, sealing the bat inside. Take outside, remove ‘lid’, let mosquito killing machine go. We do it all the time in the school where I teach, the attic is FULL of bats. This is the Bruce Wayne from another Earth that never came to be Batman because he did this to bats as a kid. Once caught a bat with my bare hands… It was flying around the room and my brothers girlfriend and her friends were screaming, couldn’t catch it with a towel (dont ask) so went after it with hands. got it on the first try. little bastards have got some crazy fangs! 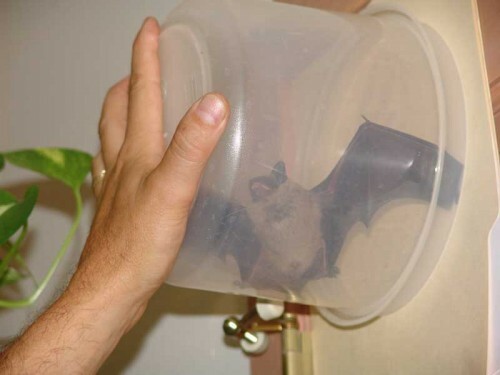 Bats are seriously awesome, especially the “flying fox” variety. They look like dogs, but with wings. They’re just very misunderstood. What do Tupperware and walruses have in common? I know. I was drunk as hell at the time. Had just been chundering souvlaki outside when i cought the bat. it was only a little one. hand sized. @Phyreblade: Bats…they are sick. I cannot hit curve ball. Straight ball I hit it very much. Curve ball…bats are afraid. I ask Jobu to come…take fear from bats. @Lakiamia: Have you tried cigars and rum? @nyokki: @Lakiamia: You are both crackheads. What the hell are you two talking about? Summarise this one for me can ya Nyok? @Putridity: Major League. One of the best movies EVAR!